Established in 1969, ELC Bristol is a family-run English language school. We offer intensive General English courses and Examination Preparation courses for the IELTS and Cambridge exams. We are a member of TEN (the English Network), IALC (International Association of Language Centres), English UK and we are accredited by the British Council. We are also a Tier 4 Sponsor, licensed by UK Visas and Immigration to enrol international students under Tier 4 of the Points Based System. With the focus on teaching General English and preparing students successfully for internationally recognised examinations, we aim to provide high quality education in the English language by recruiting and retaining a team of highly experienced and qualified teachers and by being committed as a school to the progress and welfare of each individual student. This school believes that progress in language learning is achieved by creating a stimulating, supportive and active learning environment in which the needs of each student can be met. The students are the most important people in the school and every member of staff is here to help you get the most out of your time in the UK. 2 common rooms, with snooker tables, drinks machines, comfortable chairs and widescreen TVs. 2 multimedia centres with free internet access. We do not have our own café but there are many bars, cafés and shops located only a few minutes from the school. A man from a local sandwich shop visits the school every breaktime selling refreshments. The University Students' Union is only 5 minutes' walk from Pembroke House. Our students frequently tell us that the teachers at ELC Bristol are 'amazing', ’the best they have ever known’. This is so important, because teachers are the most important people in a school. We get to know all our students as individuals. Not only will we help you in the classroom but we will also interview you regularly and also plan an individual supervised self-study programme for you. Every single student is known by name and every student in the school is discussed in our weekly teachers' meetings. All of our teachers are qualified native speakers, but maybe what is more important, is that they care a lot about our students. They also have many years experience teaching English (average: 20 years) and they have worked at ELC Bristol for a long time (average: 10 years). What can you expect from your English Language Course? All courses include a minimum of 28 English language lessons per week (21 hours) + daily homework. There are lessons every morning and on four afternoons a week. There are 6 levels from Elementary (A2) to Advanced (C2), with several classes at each level. On the first day, we test you so that we can place you in a language class at the right level. Average class size: 10. Maximum 14. Minimum age: 17 (16 during summer courses). Average age 23. The school operates on a continuous enrolment basis so there may be students leaving or joining your class every week. There is normally more than one class at each level and occasionally classes at the same level may merge. As a part of your course, you can prepare for the Cambridge English: First (FCE), Advanced (CAE) and Proficiency (CPE) exams, the IELTS exam and BULATS (the Cambridge Business exam). Personal study programme with 4 hours' supervised self-study. Guided e-learning from the moment you enrol until 3 months after your course has finished. Access to the school's online Study Zone. Course book, file, supplementary teaching materials and a certificate when you leave. 2 hours of optional language activities including Conversation Club, Drama Club, Job Club and guest speakers. Job Club. Once every 2 weeks. Aims to help students who are entitled to work in the UK find a job. Usually consists of 6 bi-weekly sessions, 5 times a year. Film club - every Friday afternoon. Wi-fi and two multimedia centres (3 in the summer) with free internet access. Almost all of our accommodation is within walking distance of the English Language Centre. In general, students won't normally need to take public transport. Bristol is a relatively wealthy city and the English Language Centre is located in one of the best area of town. There are only a few language schools in Bristol, so we don't have much competition finding accommodation. The school is more than 45 years old and many of our accommodation providers have been with us for years. Sonia Lomartire recommends the Language School ELC English Language Centre Bristol. The ELC is a school for learning English. The location is Bristol and I love Bristol because it is a city but not too big or too busy as London. ELC has two buildings: Pembroke House and Abon House. I study in Abon House and is a very good school because all teachers are native english, good teachers, patients, that understand the difficulty of the students. For the students this school is perfect because it isn't big like a university and isn't small like an agency with 3 classes. There are a lot of students and you can know a lot of friends of other country with different language, different culture, different ways to see the world and the life. Bow I can go travelling for one year in a lot of different country and will see my new friends. ELC isn't only school that have a lessons in the morning until afternoon, but you have a possibility for take part a different social programme like a excursions every weekend in London, Bath, Cardiff, Oxford and other city, or one time for week you can go to conversation club in some pub, drink a tea, coffee or beer and talk, talk and talk for improve your English, more easy, more relax, more funny. Who love a sport there is every Thursday afternoon a football match with a teachers; this isn't my case. I think that this is a great, amazing experience. Student «Sonia Lomartire» attended this Language School in Bristol, England from 2017-02-27 to 2017-06-30 for 18 weeks. Jenny Burkhardt recommends the Language School ELC English Language Centre Bristol. The time went so fast now only one week left and then I go back to my country to Switzerland. I enjoy the time very much because I had a great class with very good teacher's. I meet not only in this 3 months new people from different countries. No I learn in the school much new vocabulary, grammar, speaking and listening. I think I am now ready for my PET exam and I hope I pass. When I had question or need more practice the teacher's helped me and they gave me paper for learn and practice. I think the school is real one of the best school here in England, because when you don't know you would like to do in the weekend you can go with the school to different city's in England. Like travel in England. I saw with Andrew a lot of new city's and enjoyed the time with other friends in other places. I was also a very lucky girl with my hostfamily. She cook's very well. Every evening is a different meal. When we eat together dinner we tack the most of the time 1 hour one the table about the day and the family in my country. My hostfamily went with me and my hostsister also to Wales to here mother's house for a weekend and she show as beautiful places. For 4 weeks ago my boyfriend went to Bristol to visit me. My hostfamily was so nice that he can stay by me. But he must to ply for one night 20 pounds but the breakfast was included. I think this was very friendly from my hostfamily because when we must went in a hotel were one night much expensiver. Student «Jenny Burkhardt» attended this Language School in Bristol, England from 2017-03-19 to 2017-06-02 for 11 weeks. Erina recommends the Language School ELC English Language Centre Bristol. ELC is good school in which to study English. The best thing about my stay was home stay. I can learn English after school. Talking with host family is important. The most important thing for me was talking with my friends. Another important thing was traveling in weekend on the social program. I am happy I chose this school because teacher is good. A good thing about the school is social program. Because I can make friends. Student «Erina» attended this Language School in Bristol, England from 2017-05-15 to 2017-08-04 for 12 weeks. 이수현 recommends the Language School ELC English Language Centre Bristol. I think ELC a very good school in which to study English because ELC's educational environment is very good. The the methods of teaching from school left me a good impression because it's quite different from traditional teaching. This school gives me more chance to speak, think, etc. There is no doubt that it's a good place to study English another good things about this school is I can make multi-national friends so that I can learn different cultures. However in my opinion the best reason is home stay, because this school chose a nice home stay family for me that give me a chance to enter the native people's life and learn how to get along with my housemates. So I am satisfied with ELC. Student «이수현» attended this Language School in Bristol, England from 2017-05-08 to 2018-02-02 for 39 weeks. claire recommends the Language School ELC English Language Centre Bristol. A good thing about the school is all students finish a class at the same time. so, you can go anywhere or hang out with your friends after school. On the other hand, we have 3 classes everyday (except friday ) so you might feel a little bit tired. Now, I'm living with home stay family. The best thing about my stay was the home stay family are very skilled at taking care of students. Also, it depends on the house. i can use the kitchen the same as self - carering so, i can cook whenever i want. In addition, Bristol is very beautiful city. You're able to experience modern and classic things in the city. Also, we've good parks as well. You can lie down on the grass and enjoy the sun, if you like. Bristol has many pubs and clubs so, you can also enjoy the night life. However, i think most shops close quite earlier. so, it feels a little bit in convenient. Overall, I would recommend this school because if you come to this school, you'll make a good relationship with friends who come from different countries. You're able to make good memories about this school and city. Student «claire» attended this Language School in Bristol, England from 2017-03-12 to 2017-12-17 for 40 weeks. LEE CHAE YEON recommends the Language School ELC English Language Centre Bristol. ELC is the best English school in England. It is not subjective, it's true. The class division is nice, although we feel little dull sometimes after the lunch. I want more outside activity. Bristol is secure city and has trainstation and airport. It is really convenient for students to have holiday. However, there are a lot of hills, so it is difficult to walk for a long time, although, i love this city because it has a lot of parks and harbour side, so we can see many seagulls and great views anywhere. The most interesting thing about my stay was my hostfamily. They really like to have conversation with us, so we have a lot of talks. However, I don't know why the price is the same between residence and self-catering. Anyway the most important thing for me was the conversation with my hostfamily and the foods. 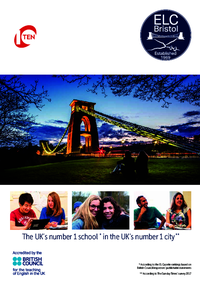 I chose this school because it is in Bristol and my Korean agent said the school was the best in England. I absolutely don't reget it. A good thing about school is that there are accommodation officers, because they always understand me and if i have some problems they help me anytime, and teachers always listen our opinion and solve our questions. Sometimes it doesn't make sense, however they listen carefully. Overall I'd recommend this school because all the things are perfect. If i have a regret, it is that i don't come here earlier. Student «LEE CHAE YEON» attended this Language School in Bristol, England from 2017-04-24 to 2017-06-02 for 6 weeks. paul green recommends the Language School ELC English Language Centre Bristol. ELC Bristol, a well known school with a good reputation, is a beautiful school with some great, friendly teachers. The course is in many different levels, so for every student there is a place. Although there are many great things about this language school, there are also some points which could be improved. Lets start positive. The teachers in this school are fantastic. They teach in an open and funny way and during some leisure activities you can even end up singing karaoke with a beer in your hand together with your Monday morning grammar teacher. Who wouldn't love that! The school is divided into two different buildings. First have Abon house which is the biggest of the two. Abon house has big classrooms with nice desks which the other building doesn't have. Penbrook ( the other building) has because of its small classrooms one big flaw, the classrooms have little annoying desks. Those desks are unstable and many times your books and pens just fall off. Still the location of those school are perfectly close to some nice places for lunch. You have two possibilities for accommodations with ELC. You can go to a homestay or to a self-catering. I chose for a self-catering which I really enjoy. I'm in a house with 30 other students. A lot of my friends live in the same house so we always do many things together like cooking and evening activities. The only bad thing about the house is that it's quite expensive and the cooking equipment is really bad. Nevertheless I really enjoy it and I could really recommend it. All in all ELC is a fantastic school with some little flaws which they can easily improve! Student «paul green» attended this Language School in Bristol, England from 2017-04-23 to 2017-06-16 for 8 weeks. jeong suk, kim recommends the Language School ELC English Language Centre Bristol. The important thing for me is the class. Elc bristol has great teachers. So they stimulate and help me to study English efficiently. I'm really happy with the school. What's more, I live with a great host family. They are my best friends in Bristol. That's why I feel fully satisfied even though I'm from far away. Taking a an English course is worth it for me. If I didn't have a chance to a take Elc Bristol, it would remain some regrets in my life. It was such a nice experience as a student in ELC Bristol, I hope you also enjoy this school. Student «jeong suk, kim» attended this Language School in Bristol, England from 2017-01-30 to 2017-07-14 for 24 weeks. Andreas recommends the Language School ELC English Language Centre Bristol. The English Language Centre in Bristol is an excellent opportunity to improve and master your English. I am so glad that I chose this school because the people (teachers, staff, host family, other students) care a lot about you and support you in every situation. The teachers are especially proficient. They always use different teaching methods and it is so much fun having such a variety of activities that motivate you to engage actively in class. Another important point is the location which is close to the centre of Bristol that has so many nice different places for food, shopping and fun activities. My host family is lovely. They were always supportive if i needed help and they wanted the best for me. All in all, ELC Bristol is an amazing institution. I've learned so much and I've improved my English a lot. I really recommend it. It was totally worth it! Student «Andreas» attended this Language School in Bristol, England from 2017-05-07 to 2017-08-26 for 16 weeks. seraina recommends the Language School ELC English Language Centre Bristol. Elc Bristol is a welcoming school not far away from the city centre of Bristol. The school is divided into two buildings which are only 5 min. away from each other. To start with , the teachers are very nice as they make you feel very comfortable in your class and help every student with their problems. We use a wide range of materials in class, form books to computers. However, the internet connection could be improved, as it is rather slow. Another good thing about Elc Bristol is the social programme which include an excursion every Saturday. Those excursions take you to lovely places near Bristol. What's more, the social programme is a great opportunity to make new friends with people form all over the world. Although the price is rather high, it is really worth it because the price for the accommodation is included. I can really recommend staying with a hostfamily as they are very nice and you get to know a little bit about the British culture. All in all Elc Bristol was definitely a good choice as I had a great time here. Student «seraina» attended this Language School in Bristol, England from 2017-05-04 to 2017-06-03 for 4 weeks. Sehee Hong recommends the Language School ELC English Language Centre Bristol. Actually, before my arrival in ELC Bristol, I wasn't expecting much because a language school is just a private institute that requires a tuition fee to teach students. However, this was a special school for me. First of all, most of the teachers are amazing. They are really friendly during the classes, but also care about their students. For example, I was slightly depressed and my teacher noticed and asked ne if I am alright and tried to solve my problem. And what I also like about teachers is that they are really flexible thinks, not just focusing on the classes. They know learning English is not just from textbook, but also know how to make students motivated. Secondly, I like the well-organized school system which is all in detail even small things. For example, the school tries to make many chances to mix lots of nationalities such as giving limit on the same numbers of nationalities in one class and holding international parties. Even such a small thing makes me moved and feel that they always care about students. As a result, I could meet many students from different countries and have chances to discuss with them which made me more broad-minded and feel the difference between them and me which makes a big difference from the past o myself. Student «Sehee Hong» attended this Language School in Bristol, England from 2017-01-02 to 2017-06-23 for 25 weeks. soheepark recommends the Language School ELC English Language Centre Bristol. I’m satisfied with this school. The most satisfying thing is the quality of teaching. All of teachers are excellent and understand each student who has a problem with English. This school has everything which students need. In particular, if you need to take an exam it is perfect to study here because they give you very useful information. The school facilities are also good. I have been here nearly 9 months but I haven’t felt any discomfort from them. The social activities which the school offers are a very good chance to get close to other students and teachers. The last thing is all of the school staff are very kind and generous. If you have any problem about the U.K life they will be happy to help you. Student «soheepark» attended this Language School in Bristol, England from 2016-08-07 to 2017-06-09 for 44 weeks. 塗宗融 recommends the Language School ELC English Language Centre Bristol. I highly recommend going to this school. First, teachers are very professional, patient and kind and they understand students. It’s good for students to have interest in the class then they are happy to learn English. Second, the class size in this school is nice. Usually we have approximately 10 students in one class, which I think is a very good number. Teachers can look after every student and make sure everyone can follow the class. Thirdly, this school has a fantastic social program. You can have different interesting activities every week, especially the excursions. We can go to another city in the UK with school teachers, and they introduce the history of the city very well. I have really enjoyed every excursion. Finally, the accommodation in this school is nice. There are good quality rooms, kitchen toilet and meeting room and the house families are great as well. They are very friendly and always care about us. So that’s the reason why I highly recommend this school. Student «塗宗融» attended this Language School in Bristol, England from 2016-09-12 to 2017-06-23 for 41 weeks. JongYo Park recommends the Language School ELC English Language Centre Bristol. Overall, the school is satisfactory. I have been studying at this school for 4 months. At first I was pre-intermediate and now I am upper-intermediate. I met a lot of students and teachers. Most of the teachers in English Language Centre have exceeded my expectations. Their teaching styles make me impressed. There are lot of students from different countries and we share our culture in the class and there's a great social programme. We have international food party every term and conversation club every week. I am satisfied with these good opportunities. Student «JongYo Park» attended this Language School in Bristol, England from 2017-02-06 to 2017-11-10 for 40 weeks. Samuel recommends the Language School ELC English Language Centre Bristol. Now I've been going to the ELC school for more than two weeks an I'm enjoying the time here very much. I'm very impressed by the teachers, all of whom are very motivated and trying to create a good atmosphere. When it comes to the social program, which is very useful for the new student to meet all the people, I can highly recommend joining it very often. As far as I'm concerned the social program provides a very good opportunity to talk and improve your English skills. Moving on to the homestay, I recognised how carefully they chose the hostfamilies and I've never heard anybody complaining about the homestay. Overall the school is a very friendly setting and I would probably recommend this school to others. Student «Samuel» attended this Language School in Bristol, England from 2017-05-14 to 2017-06-03 for 3 weeks. Hobi Los recommends the Language School ELC English Language Centre Bristol. There are over 20 teachers, all of whom are very friendly and really motivated. You'll be in a class exactly for your level. The social program, which is organised by the administration staff and the teachers, is very diversified. The school buildings are both very easy to find and quite near to the most of the residences or homestays. Student «Hobi Los» attended this Language School in Bristol, England from 2017-05-07 to 2017-06-02 for 4 weeks. 장가람 recommends the Language School ELC English Language Centre Bristol. The English Language Centre is one of the several schools in Bristol. I have been staying in Bristol for 8 months. For now, I'm very satisfied with the E.L.C. because the facilities, teachers, accommodation, etc, everything is perfect. In particular, the quality of teaching is really excellent. There are lots of teachers, all of whom are kind and generous. They always try to understand students and encourage us to speak English and there are many kinds of social activities, You have the chance to meet new friends. All in all, I would definitely recommend this school to others. Student «장가람» attended this Language School in Bristol, England from 2016-09-26 to 2017-07-21 for 43 weeks. Jinho recommends the Language School ELC English Language Centre Bristol. Overall, I'm really satisfied with school in terms of great teachers and nice infrastructure. I found the teaching quality very excellent! When it comes to the social program, it really meets student needs. In particular, the school trip with the teachers has been very satisfactory since teacher's explanation about the city & history was very interesting and helpful to understand British history & life. However I think some facilities need to improved. Some chairs in the class room are very uncomfortable to study. Moving on to the elective course, I found it is not that helpful compared to the normal course. Sometimes I felt it wasn't prepared well since we just watched video during the class. All in all, I would strongly recommend this school to others, especially my korean friends. Student «Jinho» attended this Language School in Bristol, England from 2017-04-03 to 2017-06-23 for 12 weeks. SamanthaPafumi recommends the Language School ELC English Language Centre Bristol. From what I’ve heard and experienced, I think ELC Bristol is the best school around there. The atmosphere is great, the teachers, staff and students are all very friendly and outgoing, so that you really enjoy going to school. They let you know that they care about you and that you can always talk to them about any possible problems. We had a lot of activity and excursion options (I spent almost every weekend in another part of England and had a lot of fun things to do during the week) and it was a great way to get to know other students and the country. I fully recommend this school to everyone! They ensured that we had a great time in Bristol, with a lot of fun and last but not least: that we passed the exam. Student «SamanthaPafumi» attended this Language School in Bristol, England from 2015-04-12 to 2015-06-13 for 9 weeks. MarilouMáireLabhaoise recommends the Language School ELC English Language Centre Bristol. I stayed at the ELC Bristol in 2009. I attended a couple of language schools before and afterwards. All were good, but ELC Bristol was the best. Bristol and (the Pembroke House) is a lovely place. All teachers are so fantastic. We were taught so many things - that was amazing!!!! I still remember Stephen’s classes, in which we definitely learnt how to make the most of our grammar and listening skills. Cath and Marc not only knew how to ameliorate our range of lexis, but also taught us important and interesting things. They gave us insights in all fields of life. and they were so kind-hearted, something I never experienced again. I still remember going to the cricket ground or analysing films like Love Actually or the Fawlty Towers. It helped me a lot in terms of cultural understanding. So, you can learn so many things there, beginning with grammar and ending up with nice tours around the city and getting to know the culture and history of England and Bristol. You really have to go there!! If time allows and I can afford it, I will definitely come back. I do miss this school, I do miss the lovely Duncans and I do miss all of the staff there. Spent the best time of my life there. Student «MarilouMáireLabhaoise» attended this Language School in Bristol, England from 2009-03-22 to 2009-06-19 for 13 weeks. ElianeHidber recommends the Language School ELC English Language Centre Bristol. Nearly everyone in my class was preparing for the same exam, which meant that only a few members changed class and the class didn’t change too much. That certainly helped with bonding, but there were also many excursions and activities planned by Andrew, who is responsible for the social program, and the electives are ’inter-class’ as well, so you have many opportunities to get to know other students. The atmosphere in the school was very friendly and familiar, so it really was easy to feel comfortable from the get-go. As lovely as the school is, the city itself doesn’t have to hide either. I love everything about Bristol - Clifton, the harbour, the College Green, Park Street, the older part of the city in Redcliffe, but also the shopping centre at Broadmead or the more urban parts like Redland. There are many small, independent shops to check out, and cafés, bars, pubs and restaurants for everyone. There’s a great music scene - I went to a handful of concerts during my stay, one of them on a boat and another one in a church, and there are also many pubs that have Open Mic nights, which are worth checking out as well. It’s also really great that ELC students can often join clubs from the University of Bristol - and they have clubs for anything, whether it be art, sports, music or whatever. I’ve made some great friends and some wonderful memories, learned a lot, passed my exam and fell in love with the city, so I definitely would recommend both the ELC and Bristol to anyone considering a language stay in the UK. Student «ElianeHidber» attended this Language School in Bristol, England from 2013-09-15 to 2013-12-06 for 12 weeks. Unihoc_1996 recommends the Language School ELC English Language Centre Bristol. ELC Bristol is the best language school I know. Because John and his team found the best mix between learning a foreign language and have fun into all the classes. The atmosphere in all rooms are good, the very competent teachers are every time friendly and helps you with every kind of problems. The social programs is great. There are such different things like excursions, play some bowling or meet all students at the big school party. Finally I can suggest this language school to everyone who wants to learn English and like to have fun by do it. Student «Unihoc_1996» attended this Language School in Bristol, England from 2015-07-20 to 2015-08-14 for 4 weeks. MarkellaStratou recommends the Language School ELC English Language Centre Bristol. When I went to ELC, my level was under lower. With the help from the school the first year I took the lower certificate and the second year the advance. I had the best time of my life and after so many years I have still contact with some of my friends. Student «MarkellaStratou» attended this Language School in Bristol, England from 1995-09-01 to 1997-06-27 for 95 weeks. Alex Zhang recommends the Language School ELC English Language Centre Bristol. I pretty like this school. i will highly recommend my friends to come to this school to learn English. the course is fantastic and teachers is helpful and friendly! what im going to say is this is definitely best language school iv ever studied in! I love here, i love the city! Student «Alex Zhang» attended this Language School in Bristol, England from 2016-03-07 to 2016-07-15 for 19 weeks. JiWonYang recommends the Language School ELC English Language Centre Bristol. very very very very good for me. my class has many desk but its too small.. I want to change this one. Student «JiWonYang» attended this Language School in Bristol, England from 2016-04-25 to 2017-01-13 for 38 weeks. Nina015 recommends the Language School ELC English Language Centre Bristol. An der ELC Bristol hatte ich die beste Zeit meines Lebens! Unterricht wurde von kompetenten, geduldigen und herzlichen Lehrern durgeführt. Durch das gut geplante und vielfältige Freizeitprogramm hatte ich auch die Möglichkeit, Schüler aus der ganzen Welt kennen zu lernen. Ein grosses Danke möchte ich hiermit an den Schuldirektor John Duncan richten. Für die jenigen, die Zeit und Geld effizient einsetzen möchten wird die ELC Bristol die beste Wahl sein. Student «Nina015» attended this Language School in Bristol, England from 2013-07-29 to 2013-08-09 for 2 weeks. ca4n2d9y recommends the Language School ELC English Language Centre Bristol. I had a very good time in this school! Teachers and classmates are so kind to me. I really want to stay longer,I miss there so much! Student «ca4n2d9y» attended this Language School in Bristol, England from 2013-07-08 to 2013-08-05 for 4 weeks.